"The Ira Wiley House was located on the west side of Main Street at the site of the present Traders' Block. The house was moved further back on the lot shortly after the photo was taken, to accommodate the Traders' Block which was built for the Middlesex Traders in 1897. The Ira Wiley House was operated as a boarding house where residents could 'board by the day or week.' It was conveniently located next to the Wakefield & Stoneham Street Railway Company office and waiting room. It is reported that the family was active in business, with a relative of Ira Wiley the proprietor of a shoe store at the corner of Main and Mechanic Street. 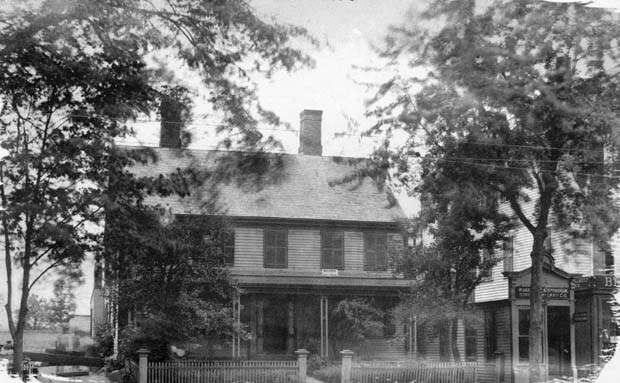 The house was razed in 1930, when the Traders' Block was remodeled and enlarged for the J.J. Newbury Co. store." -- Text from calendar by Jayne M. D'Onofrio. “Ira Wiley House - Main Street, circa 1896,” NOBLE Digital Heritage, accessed April 20, 2019, https://digitalheritage.noblenet.org/noble/items/show/6990.